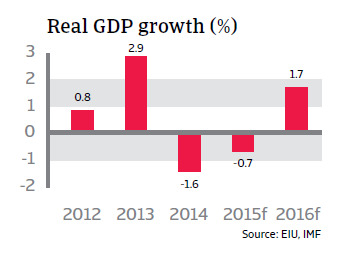 Argentina’s economy contracted 1.6% in 2014, and this negative trend is expected to continue in 2015, as exchange and price controls are forcing producers to scale back their activities. President Kirchner faces increasing troubles due to the dire state of the economy and her business unfriendly economic policies (see below) and allegations that her government and the intelligence agency covered up the involvement of Iran in a bomb attack on a Jewish Centre in Buenos Aires in 1994 in exchange for favourable trade deals with Iran. Social unrest is increasing, raising the already high risks to political stability. It is expected that there will be no major policy change before the presidential and general elections due to be held in October 2015. After having served two terms already President Kirchner is constitutionally prohibited from running again. Argentina went into sovereign default on July 30th, 2014, after the government failed to secure a settlement with litigant hold-out creditors in line with a US court ruling. This ruling effectively prohibits Argentina from making payments to restructured bond holders without also paying the hold-outs in full. So far, Argentina has missed two payments on its restructured bonds (although it did make the July payment to its trustee bank in New York, that payment did not reach bondholders due to legal injunctions). The default has derailed the government’s efforts to improve its relations with international investors in the wake of rapidly declining international reserves and deterioration of the economic performance. With no resolution of the disagreement between the Argentine government and holdout creditors expected in the near future, the country will continue to be shut out of global capital markets (Argentina has no access to capital markets since its default in 2001). The default has resulted in another round of interventionist policy measures: In order to preserve official reserves, the government has restricted import payments further and has tightened financial regulations, including forcing banks to sell their dollar holdings. To limit inflationary pressures, the government has implemented a new law to control prices, set profit margins and prevent supply shortages. Additional measures to boost the dollar supply can be expected. These may include regulations to force exporters to sell their dollar holdings and to curb tourism-related outflows. The Argentinian government has targeted some large international companies, accusing them of fiscal evasion and other offenses that appear driven by a need to raise revenue, but which the business community perceives as unfair harassment. Not surprisingly, some international companies are partially closing their plants or even leaving the country entirely due to lack of imported parts needed to complete production cycles. The debt default, increasing interventionist policies and decreased prices for commodities (especially soy beans) have exacerbated Argentina´s economic crisis. The economy contracted 1.6% in 2014, and this negative trend is expected to continue in 2015, as exchange and price controls are forcing producers to scale back their activities. 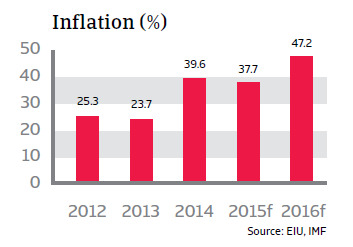 Unemployment is expected to rise to more than 11% in 2015 and inflationary pressures to remain high. Domestic consumption continues to suffer from low consumer confidence and widespread fear of job losses. The risk of a steep and uncontrolled peso adjustment remains very high. The Argentinian peso still remains substantially overvalued, and the risk of a steep and uncontrolled peso adjustment remains very high, given declining official reserves, lack of access to capital following the sovereign default and still substantial external arrears (interest arrears amount to about USD 15 billion). It is expected that in any case a currency depreciation will take place after the next presidential election in October 2015, which could trigger an increase in the already high inflation rate to more than 40% in 2016. Official reserves were at 4.8 months of imports in 2014, still above the threshold of three months, due to lower imports and oil prices, which somewhat mitigated the effect of lower prices for Argentina´s export commodities on the external accounts. Official reserves are however insufficient to cover the external refinancing needs. The unofficial USD exchange rate is almost 60 % higher than the official rate. This is making the availability of USD and other currencies very scarce for importers – regardless of the presence of an import contract/license – and puts further strain on businesses´ profitability if the peso devalues. The increasing shortage of foreign exchange for Argentine importers has already led to increased payment delays and even defaults. 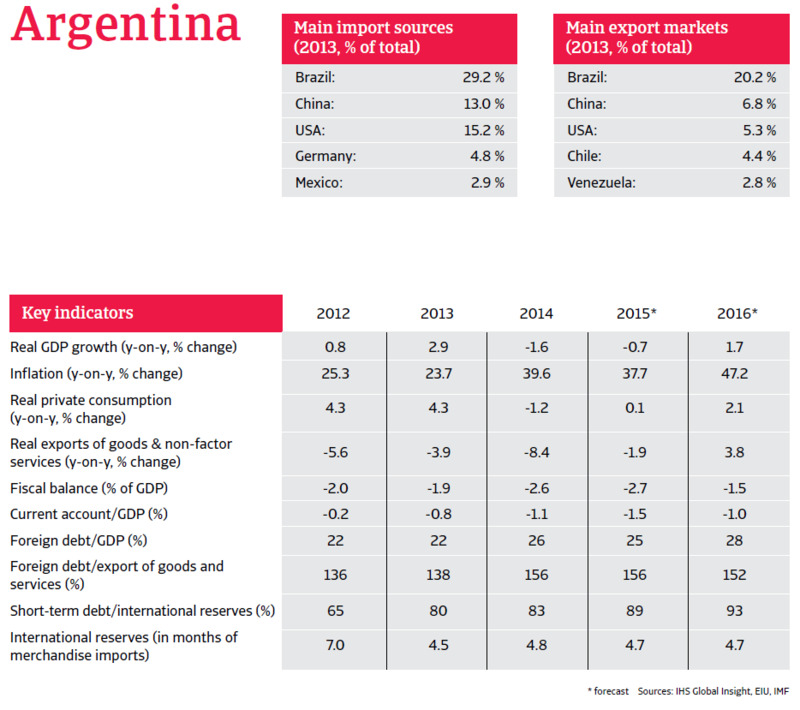 Therefore caution is advised for exporters to Argentina. While they might have had good payment experiences in the past, the situation has worsened. It is expected that the current government will launch additional business-unfriendly actions if fiscal conditions deteriorate further – increasing the risk of an even steeper recession and an uncontrolled currency devaluation. No policy improvements are expected before the presidential and parliamentary elections in October 2015 – i.e. only after a new government takes office at the end of the year. The same goes for a final settlement with Argentina´s hold out creditors. As long as there is no settlement Argentina´s financial situation will remain precarious. Doing business in Brazil can be challenging if you’re not used to the local business environment. The ten principles set out in this report can help make trading relationships lasting and successful. The slowdown in the economy has affected Brazil’s automotive sector and payment delays and defaults are expected to worsen in the coming months.